Depending on where you sit in the conversation – or indeed where your satellites sit in orbit – providing inflight connectivity over polar routes is either darn near essential or not necessary at all. 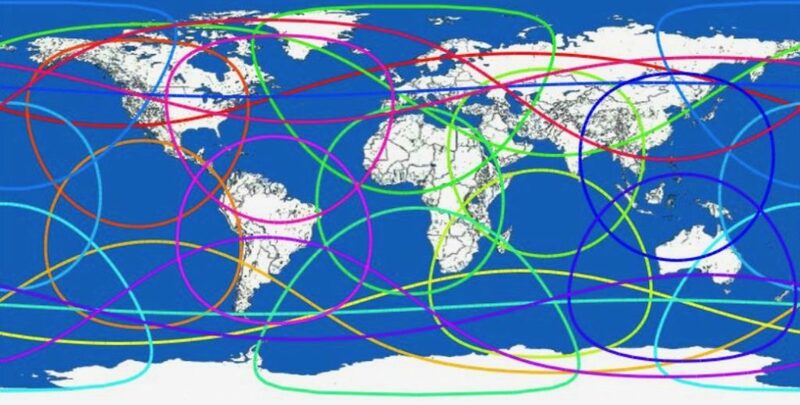 For Viasat, which is presently building out a not-quite-global GEO constellation, polar coverage is becoming increasingly important. And it knows it stands to benefit from being able to make the ‘fully global’ claim in aviation. That’s among the many reasons why it is seeking approval for an NGSO network featuring 24 MEO satellites with Ka- and V-band frequencies, and putting resources behind it, as management expressed on the company’s recent earnings conference call (during which it also announced a meaningful follow-on IFC deal with American Airlines). But during an interview with Runway Girl Network, Viasat VP commercial mobility Don Buchman said the satellite operator and inflight ISP is studying all its options “very hard” for going global, not just its own proposed MEO constellation which would be integrated with its GEO network. Would Viasat consider packaging its current broadband connectivity offerings with Iridium NEXT, for instance? Even though NEXT will provide a kiteline-sort of connectivity in terms of bandwidth, it is among the multitude of services being studied, confirms Buchman, noting that Viasat already goes to market today with Ka, Ku, and hybrid Ku/Ka for coverage purposes, even though it doesn’t see Ku as offering the same experience as its high-capacity Ka offering. With Telesat, OneWeb, SpaceX and others tabling constellation plans, and even Boeing eyeing the skies for a massive LEO network (which SpaceNews reports has stagnated), space will get a whole lot more crowded if even a couple of these networks come to full fruition. Buchman says Viasat has “no expectation” of a timeline for when the FCC will approve its own NGSO proposal, saying the firm is “just really studying it” to make sure its go-to-market strategy is right. It’s all still in play; if we find the right collaboration partner, [we] would entertain that. On the MEO/GEO antenna development front, Viasat is not very far down the road, with Buchman saying the firm is, as ever, open to either building its own in-house solution or finding alternatives if there is something viable on offer elsewhere. Meanwhile, Viasat continues to focus on building out its GEO network. The antenna malfunction on ViaSat-2 will not impact the firm’s aero plans, Viasat reiterates to RGN. “Yeah, it really hasn’t affected anything we’re doing in aero,” says Buchman. The first two satellites for the ViaSat-3 constellation are under construction, with a 2020 launch date slated for the Americas and “six months later” the launch of the EMEA satellite. Viasat expects to share more information about its progress in the near future. That’s obviously good news for #PaxEx. But on that front, Viasat doesn’t want us to box it into just being considered an inflight broadband connectivity provider. Its American Airlines deal includes wireless IFE. And with Delta not-so-quietly testing Gogo TV, Viasat’s Buchman reminds us that IPTV “is definitely square in the middle of our messaging; we did it [via seatback integration with PAC] on Virgin America; it had 18 channels that were on the Viasat fleet under the Virgin America banner”. The TV service, operated over Ka satellites domestically is “still an offering” for would-be airline customers, and “it doesn’t need to be 100 channels” because these days it’s all about having “the right channels”, he says. Viasat is “getting a lot of interest as well from over-the-top providers, similar to how Amazon and Netflix wanted to get their products [on board].” Sling TV with CNN over Ka anyone?